Arun is at the grocery store once again with Mrs. Patton. She is telling him that when her children were little, she would take them with her grocery shopping, they would fill up the cart together, and then the food would all be gone within a week. Now, she says, nobody in her family likes to eat at the dinner table or together anymore. Her job is to fill the freezer, and everybody can take out what they want when they want it. Arun thinks of telling Mrs. Patton about his concerns about Melanie’s eating habits, but he is afraid to show too much interest in her. Mrs. Patton says that unlike her and Arun, nobody else likes anything that she cooks, and the intimacy of her comment makes Arun feel uncomfortable. While Mrs. Patton is blindly focused on exploring vegetarianism and her one-sided friendship with Arun, it is obvious to Arun that something seriously is wrong with Melanie, and that is what Mrs. Patton should be thinking about. He is especially turned off by Mrs. Patton’s attempts to get close to him because he knows that she shouldn’t be putting her energy into him, but into her daughter. Her family isn’t just eating away from the dinner table; they are disjointed from each other in every aspect of life. Ballinger-Dix, Elizabeth. 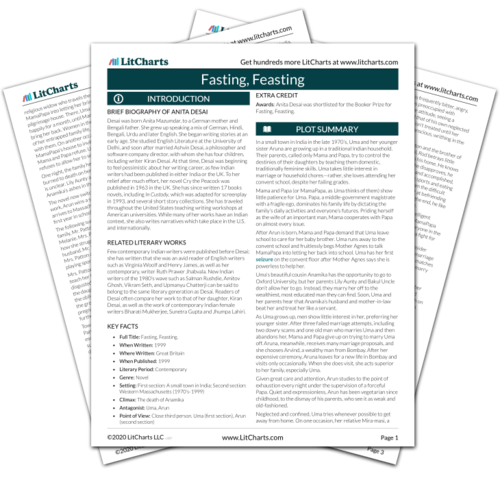 "Fasting, Feasting Chapter 22." LitCharts. LitCharts LLC, 7 Sep 2014. Web. 22 Apr 2019. Ballinger-Dix, Elizabeth. "Fasting, Feasting Chapter 22." LitCharts LLC, September 7, 2014. Retrieved April 22, 2019. https://www.litcharts.com/lit/fasting-feasting/chapter-22.